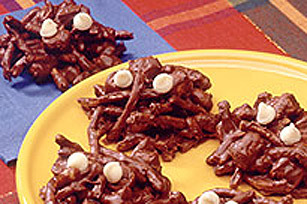 Kids will love these easy, no-bake Halloween treats. Mix chopped chocolate and butterscotch chips in large microwaveable bowl. Microwave on MEDIUM 3 to 4 minutes or until chocolate and butterscotch chips start to melt; stir until chocolate and butterscotch chips are completely melted and mixture is well blended. Add remaining ingredients; mix well. Drop tablespoonfuls of the noodle mixture onto wax paper-covered baking sheets. Refrigerate at least 30 minutes or until firm. Store in airtight container in refrigerator. Enjoy these spiders, but watch your serving size! Add 2 additional butterscotch chips to each cluster for the spider's eyes, then refrigerate as directed.